RUSH: To Cookeville, Tennessee, we go. This is Kathy. Kathy, great to have you with us. By the way, Kathy is one of my all-time top ten favorite female names. CALLER: Oh, I am so impressed to hear that. CALLER: I’m so impressed to talk to you, I’m practically speechless — which if you knew me well, it has not happened very often. RUSH: I can imagine, because you’re a woman. CALLER: Oh…. Well! (giggles) Maybe so. I was thinking last night particularly that, after doing some reading recently and biography of Winston Churchill. CALLER: You really remind me a lot of him and his convictions and his ideology, particularly in that war must be fought sometimes and that you must achieve a victory and defeat your enemies in order to achieve peace — and I just wondered, hypothetically, if things had been different, and Winston had been in your seat, and you were a caller, would you be a dittohead of his? RUSH: Oh, yeah. I’m a great admirer of Winston Churchill’s. I think he was one of the most prescient, brilliant men. My family admired him. When I was growing up, that’s when I first heard Winston Churchill. My father and grandfather adored Winston Churchill. They idolized him, and we’d sit around on Sunday, go out to my grandfather’s house, and my grandfather and my dad would all share Winston Churchill anecdotes and stories, things that they knew and things they’d read about him. 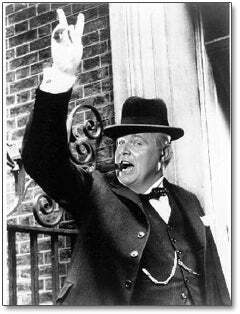 So I had an early exposure to Churchill. In fact, the first time I went to England, I went to Blenheim Palace where he was born, which is where the Duke of Marlboro now lives, who is also a member of a club where I’m a member here. So I’ve got a little bit of a connection. It’s a fascinating trip to go see where Winston Churchill was born and grew up, and I’ve read something about him, but, look, I’m blown away by your comparison of me to Winston Churchill. I thank you very much for that, but that’s a stretch. CALLER: — and for getting the word out. RUSH: I’ll tell you something about Churchill, since you want to talk about him as a commander-in-chief of sorts during wartime. Hitler was amassing power but did not have great military strength in 1936, and that’s when Churchill first started sounding huge warnings, and they wouldn’t listen to him. Nobody in Great Britain wanted to listen to him, nobody wanted to listen to him anywhere. They’d just came out of World War I, they didn’t want this bang the drums of war and stop this. And he ran around, he was doing everything he could to alert people. He said, trying to get everybody’s attention, if we deal with this now, the price is going to be very small. It’s going to be much easier to deal with Hitler right now than if we wait. But of course Churchill had to sit by and watch Neville Chamberlain travel to meet Hitler. Chamberlain came back, and he was the most popular person in Great Britain at the time. He was waving this agreement that Hitler had signed. ‘We have peace in our time! I have brought you peace in our time.’ Of course, a year after that, bam! Hitler started his march. They’re just so happy for anything to happen, and they’re so excited that the gloves have come off. They’re amplifying the importance of this. 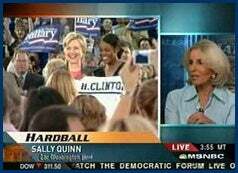 So they brought in Sally Quinn, who is the social secretary of Washington, DC, former CBS News babe and Washington Post writer, married to Benjamin Bradlee of Watergate fame during the Washington Post days. She said (paraphrasing), ‘Well, you know, Chris, um, Obama may have a point. These thugs, these dictators just want respect. You know, they’re backroom bullies and so forth, and if you just talk to them, if we just go talk to them, then it makes them feel like they’re respected, and you can talk them down from things.’ You sit here and you read this, and the mind explodes over the na&iuml;vet&eacute; because the lessons of history are: you don’t talk to them and you certainly don’t give them respect. They are murderous thug dictators. They’re tyrants! Their people live in oppression. So back to the Churchill example. Churchill said we can deal with this with so little cost and so little pain. Nobody wanted to listen to him, and look what happened! They had to deal with it. The whole world had to deal with it later on, just four years after 1936. We face the same situation here, but people want to put their head in the sands and pretend that the problem is not as bad as it is because way over there. The parallels between Iran, by the way, and Mahmoud Ahmadinajad, are many. ‘He’s just a guy that wants self-respect. Let’s just go talk to him. He’s just crying out for help. He’s the Lindsay Lohan of the Middle East. He just wants a little attention. He wants some help.’ You look at the way that country is run and you tell me if you want your wife or daughter to live there — if you want to live there! By the way, the Iraqis, you know, one of the things that is uniting the Iraqis against equate that these Islamofascists are coming in with — I love how the media calls it all kinds of new ‘conservative’ behavioral rules. One of the things that the militant Islam fascists of Al-Qaeda have stopped, is smoking, and Iraqis love to smoke cigarettes, and the Iraqis are having their index, middle finger of their right hands cut off if they are seen by Al-Qaeda smoking cigarettes, and this is making them mad. We’ve got stories of troops marching into areas and rescuing some people that have been pinned down for a while, citizens, and the first thing they ask for is cigarettes, not food and water. This is turning average Iraqis against Al-Qaeda. Can you imagine the goodwill if we’d just drop a bunch of Camels — the cigarettes, a bunch of Camels; it’s a perfect brand — right into Baghdad and some of these areas? We could own the place. The cigarette airlift across Iraq. It makes all the sense in the world. Little things like this. At any rate, we’re going to have to deal with this one way or the other. Whatever the Democrats do, pull us out, keep us there, we have no choice but to defeat these people. That’s the clarion call that Winston Churchill kept trying to get the British people to understand. But the liberals of his day just like the liberals of our day, liberals are liberals, didn’t want to deal with it; didn’t think it mattered. Hitler could run roughshod all over Europe but he wasn’t going to touch us because he signed that thing with Chamberlain — and of course Neville Chamberlain actually went and talked to Hitler, right? He had to talk to him to get the signature, had to get ‘peace in our time.’ He followed the Sally Quinn rule. And the next thing the Brits new, they’re being bombarded with rockets and threats of attack all over the place. You gotta deal with your enemy by defeating them if you want to maintain your own freedom. Is America Today the France of Yesterday? ‘Moral paralysis’ is a term that has been used to describe the inaction of France, England and other European democracies in the 1930s, as they watched Hitler build up the military forces that he later used to attack them. It is a term that may be painfully relevant to our own times. Back in the 1930s, the governments of the democratic countries knew what Hitler was doing — and they knew that they had enough military superiority at that point to stop his military buildup in its tracks. But they did nothing to stop him. We know now how short that time was. Less than a year later, World War II began in Europe and spread across the planet, killing tens of millions of people and reducing many cities to rubble in Europe and Asia. Looking back after that war, Winston Churchill said, ‘There was never a war in all history easier to prevent by timely action.’ The earlier it was done, the less it would have cost. At one point, Hitler could have been stopped in his tracks ‘without the firing of a single shot,’ Churchill said. That point came in 1936 — three years before World War II began — when Hitler sent troops into the Rhineland, in violation of two international treaties. At that point, France alone was so much more powerful than Germany that the German generals had secret orders to retreat immediately at the first sign of French intervention. As Hitler himself confided, the Germans would have had to retreat ‘with our tail between our legs,’ because they did not yet have enough military force to put up even a token resistance. Why did the French not act and spare themselves and the world the years of horror that Hitler’s aggressions would bring? The French had the means but not the will. ‘Moral paralysis’ came from many things. The death of a million French soldiers in the First World War and disillusionment with the peace that followed cast a pall over a whole generation. History may be interesting but it is the present and the future that pose the crucial question: Is America today the France of yesterday? We know that Iran is moving swiftly toward nuclear weapons while the United Nations is moving slowly — or not at all — toward doing anything to stop them. It is a sign of our irresponsible Utopianism that anyone would even expect the UN to do anything that would make any real difference. Not only the history of the UN, but the history of the League of Nations before it, demonstrates again and again that going to such places is a way for weak-kneed leaders of democracies to look like they are doing something when in fact they are doing nothing. The Iranian leaders are not going to stop unless they get stopped. And, like Hitler, they don’t think we have the guts to stop them. Incidentally, Hitler made some of the best anti-war statements of the 1930s. He knew that this was what the Western democracies wanted to hear — and that it would keep them morally paralyzed while he continued building up his military machine to attack them. Iranian leaders today make only the most token and transparent claims that they are building ‘peaceful’ nuclear facilities — in one of the biggest oil-producing countries in the world, which has no need for nuclear power to generate electricity. Nuclear weapons in the hands of Iran and its international terrorist allies will be a worst threat than Hitler ever was. But, before that happens, the big question is: Are we France? Are we morally paralyzed, perhaps fatally? Copyright 2007 Creators Syndicate Inc.